How have you been? yui from Tokyo! 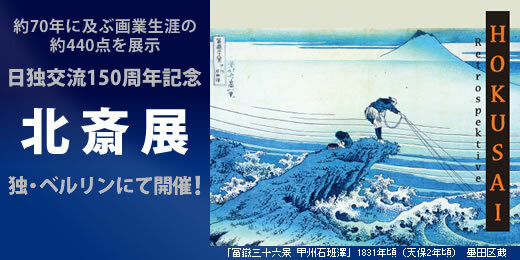 “Hokusai-Retrospective” just started in Berlin on August 26 2011! Approximately 440 masterpieces of Katushika Hokusai, a renowned Ukiyo-e artist in Edo era, are displayed. The media might cover this exhibition which has been held to celebrate the 150th anniversary of friendship between Japan and Germany. “Kajikazawa in Kai Province” from the series “Thirty-six Views of Mount Fuji” for the poster of the exhibition uses an impressive brilliant color of Aiiro! Aiiro is “indigo” in English, and a word for Aiiro in other languages such as French, German and Spanish also stems from “indigo blue”. Isn’t it interesting to know “indigo” is a common word in various languages? In Japanese, in addition to words to describe basic colors such as blue, red and yellow, and ones for colors originated from dyeing such as Aiiro and Akaneiro, there are many colors named from plants, animals, insects and things such as Hiwadairo, Wakatakeiro, Uguisuiro, Tamamushiiro and Nandoiro. For example, Nandoiro is deep blue, which gives impression of back at Nando (Japanese closet), but I haven’t heard about it, so I couldn’t even imagine what the color is like. But, in the old days, people were familiar with Nando, which helped everyone imagine the color easily. In these days, some names of colors are hardly used in daily life, but such names of colors let us know things familiar to people who have used the names. Come to think of it, the names of colors are not just words, but may explain local culture well. Now, I feel like checking if there are interesting names of colors in other languages as well!